I always had my nose buried in a book as a kid. There were days I spent the entire day reading, only to walk down to dinner in a daze, my mind in an entirely different world. I'm so excited to see him discovering the love of books! He has so many reading delights in store. Readers, did you love to read as a kid? I sure Did! and still do! I read a lot as a child but once into my 30's it fell along the wayside. I began to notice I would lose concentration and simply gave it up. Then in my 40's I found that the computer was my true love and that habit just all but made the reading of books disappear in my life. *sigh* With children I think it's something they need to do on a regular basis, and having that book in the hands rather than reading words on a computer screen is key to learning to love books. I am excited for him! Yes, he has so much in store for him. He can travel back in time, around the world, outer space or anywhere the author takes him! The possibilities are endless! I was like this as a child, I remembber my Daddy telling me that I would not sit at the supper table and read a book! I read many books sitting in the tree house too. I was happy when we went to the library. Must have been the only child that begged to go to the library and planned every trip in detail. I am the nerd that got excited when our Lit. teacher gave us the reading list for the year becuase there might be something that I hadn't read yet. More so now than when I was little. I can imagine how much this delights your heart...I think it develops a child's imagination. I was quite a reader, as a kid.. nowadays it's on and off.. and right now it's "on", a new series of police/crime stuff. I didn't read much as a kid but I made up for it as an adult. I think it is so important for kids to read... Good for Pierce. I can't wait for JDaniel to start reading books. Having him become friends with the librarian can be a plus to get him interested in more. This was someone who was always my friend, leading me to spend lots of time reading. I later served on 2 library boards, and even taught reading for a bit. I was a "Little House on the Prairie" girl. The good old days. Sweet photo. Yes, I loved to read, also. This is so exciting! I can understand how this makes you so happy. I was a bookworm as a child and I still am. I spent many an hour stretched out on my bed, reading. I'm grateful that my parents were supportive of my reading and I was taken to the library quite often. Yes! Loved it! And this is a wonderful photo of him. Such a sweet picture. 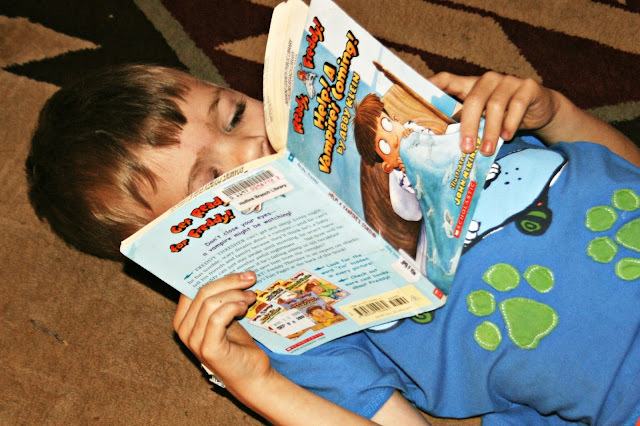 I believe the best thing a parent can do for their child is to instill the love of reading. Good for you. Oh, I love this! There's something magical about the first book that really draws you in. Happy reading! I loved to read as a kid and still do. My 18 month old little girl is obsessed with books already. It's not unusual for her to bring you 20 books in a day and expect you to read them to her. I love it! I lived in books. At least that's how I felt. I was afraid for my sons when they were young until they discovered a mystery series that interested them. I will check out Ready Freddy for my grandchildren. Thanks for sharing. it's so important lisa, and wonderful that he's enjoying it!! with some kids, especially boys, it's a struggle!! Sadly I was never much into books, my parents were not readers at all. I did read to my children but not like I wish I had. I do enjoy reading now but really need to set more time aside for it! That is so cute! I guess you just have to find the right book to get them interested in reading. I loved to be read to, but I had a hard time letting go of picture books. To this day that section of the bookstore calls my name. I just had a hard time letting go of the pictures inside. Mica loves to read! I'm hoping Isaak does to! That will make trips nice a calm. ohh book reading is wonderful!!! yippy- a whole new world to discover! Loved reading, and my children were early readers too! Isn't it remarkable how they seem to absorb themselves into a book! Pierce reminds me of Chris when he was this age. Thanks for stopping by to visit...we really appreciate it! Awesome! I don't know these books, but they must be very engaging. That is neat, Lisa. I know you are happy that he loves it like you did/do.... That's so important for kids.. Such a cute picture! I read a lot as a child... would come home from the library with six books at a time.